Monsieur Stanislas Cassel is a state criminal investigator in Paris, France during turbulent times for his country. Unemployment is high. Many French are scared and unsure about the future. Extremist politicians promise a better life, if they are elected. Within this milieu, Monsieur Cassel works. However, this grandson of a French propagangist for the Nazis during their World War II Occupation, ashamed of his family's infamy, avoids anything political. Instead he buries himself, tracking down perpetrators of small crimes, his Little Miseries. One current dossier involves a pensioner's strange murder. During his pursuit for the killer/s, Cassel meets a beautiful Jewish woman, whose family was shipped to a death camp in 1942. Haunted by man's inhumanity, she tries to alert him to the Far Right's reemergence in Europe, but to no avail. Only when tragedy strikes does he awake to his blindness and understand a truth: a larger evil beyond his Little Miseries, as the Occupation portended, lurks. 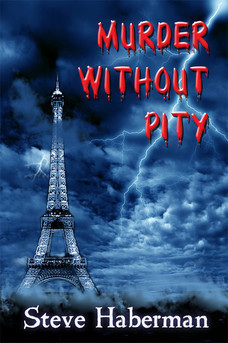 MURDER WITHOUT PITY, a novel about the past, the present, betrayal, murder, and redemption. Based on a true historical event.